Background notes: Storm P. was one of the people who introduced the comic medium in Denmark. He started with the strip Kan De Det? in which he introduced three small men as a part of the supporting cast. After a few months the three men dumped the guy they worked for and few months later again, a new character was introduced. The new character's only job was to put numbers on the pictures in the comic strip and was named Nummermanden (The Numberman in Danish). With the introduction of Nummernmanden, De tre små mænd og Nummermanden was created. The stories and ideas were imaginative and the humor offbeat, anarchistic and respectless in the vein of The Katzenjammer Kids, only as pantomime. Until 1923 Storm P. made a strip per week, first in the weekly magazine Verden og Vi until 1916 and then in the newspaper B.T. 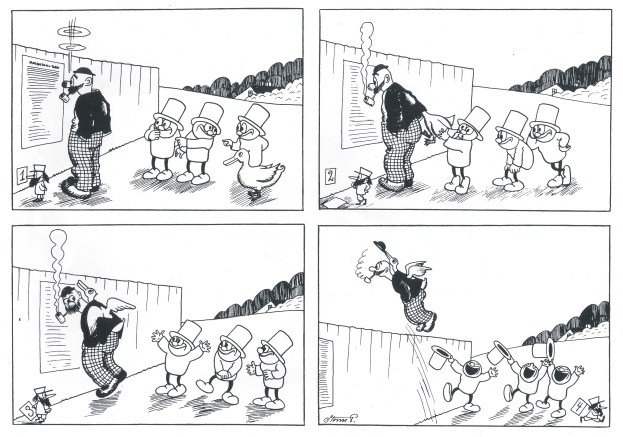 After 1923, strips were made on an irregular basis until the series stopped in the 1940's. 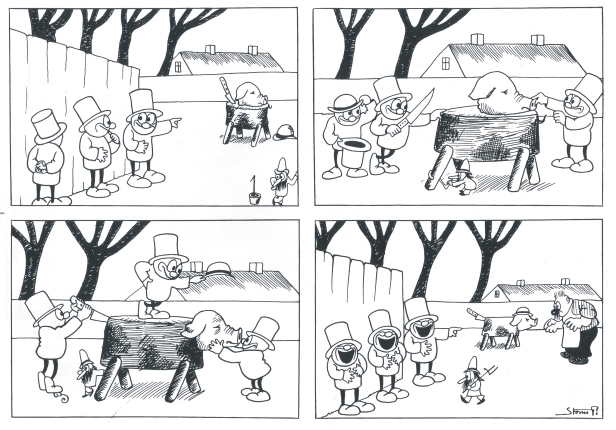 The series was mostly published as a comic strip, but Storm P. also created a small story called De tre små mænd og den vidunderlige vandkande. The story was written in 1921, but it wasn't until 1952, after Storm P.'s death, that it was published. The short story was accompanied by text by Storm P. contrary to the normal comic strips. 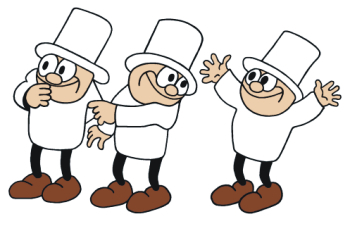 De tre små mænd were some of the first comic book characters to cross over to other media. A short cartoon premiered December 26th 1920. The cartoon was produced by Storm P. and Carl Wieghorst and was the first Danish cartoon. Unlike most comic book characters, De tre små mænd was transferred to theater. In an attempt to combine circus and cabaret, Storm P. created a show where he told a story by continuously drawing on a piece of paper. A major point of the storytelling was the use of only one piece of paper with one picture at the time for the story. As the story progressed he would change and add details to the picture changing it into something new. The story was about the three men meeting a lion and how they caged it. The show premiered in Cirkusbygningen (a building in central Copenhagen) on December 26th 1913.